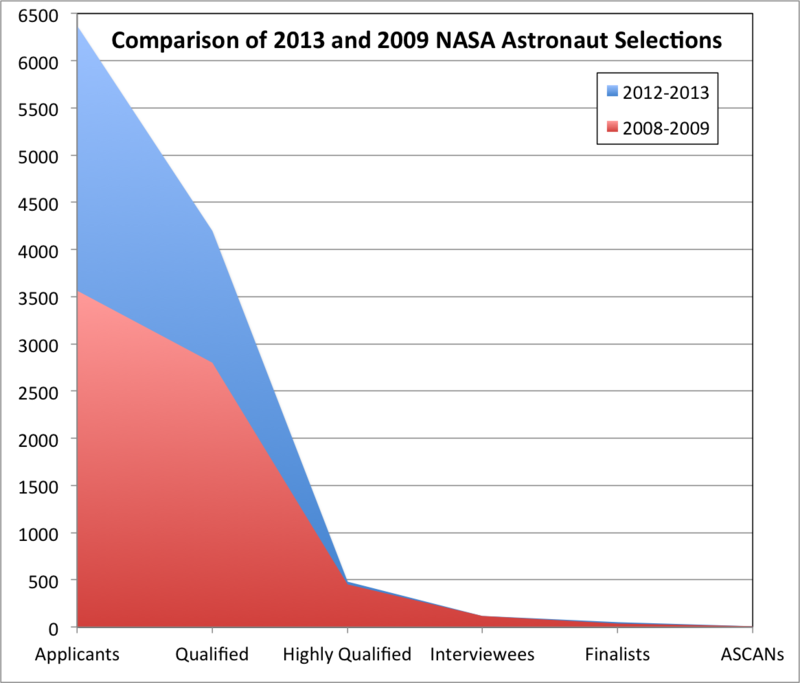 Drawing from a huge applicant pool of 6,372 total applicants, NASA could afford to be very selective as it narrowed the applicants down to only 8 people (the top 0.13%). From what I have learned, the medical screenings for this class were much more stringent than for previous classes due to the anticipated long-duration missions that lie ahead. These individuals all have impressive backgrounds, and I am sure they will be valuable additions to the NASA astronaut corps. All are SCUBA divers and have experience working in remote, harsh environments. Seven are pilots, and six of them come from the military, which is probably an indication of NASA's emphasis on test flight operations for new space vehicles. It is interesting how tightly but separately clustered in age the men and women are, with respective averages of 37.5 and 34.5. The age range was much wider in the 2009 ASCAN class. The chart shown here compares the selectivity at each stage of the process for the 2008-09 and 2012-13 selection campaigns (data in table form here). I personally find it exciting that the resumes for the two non-military selectees share elements with my own background, including field work in Antarctica (Hammock and Meir), graduating from ISU (Meir), and working for NOAA (Hammock). Hammock is an engineer with the NOAA Earth Systems Research Laboratory (ESRL) and is currently on rotation at the American Samoa Observatory. There is a great interview with her about her selection at newsobserver.com. In my capacity in NOAA, I have worked with the ESRL's Mauna Loa Observatory, and a few years ago, I actually applied for the very job Hammock has now in an attempt to move laterally within NOAA and broaden my experiences. Her selection encourages me that I am on the right track. In 2008, I was honored to make it to the Highly Qualified group in the top 3-13% of applicants. Likewise in 2012, I once again made it to the Highly Qualified round of selection in the more competitive top 2-8% of applicants. Let's hope that third time's a charm the next time NASA issues a call for astronauts. I recommend watching the following two videos associated with today's news from NASA. First, NASA Administrator Charles Bolden congratulated the new ASCAN's, praising their achievements and commitment to exploration. He emphasized how they will likely have opportunities to fly on new commercial space vehicles, as well as ones NASA is developing. Bolden's message overlays visual concepts of these future missions, as well as some of the astronaut candidate selection screening activities at JSC. If you look carefully, you'll even notice an A4H member undergoing some testing during his interview at NASA. Second, for a personal introduction to NASA's newest ASCAN's and a glimpse into the process that chose them, I highly recommend you check out the informative and engaging hour-long Google+ Hangout that NASA held earlier today. It featured in-depth biographies and photo slideshows for each of the new ASCAN's (from 4-14 minutes) and a discussion about ASCAN selection and training with Janet Kavandi, Ellen Ochoa, and other experienced astronauts. Interested citizens asked questions of the panel in a number of areas. One piece of information that surfaced is that NASA currently has 48 active astronauts today, squarely within their target corps size of 45-55 astronauts. Thus, the attrition rate will likely dictate when the next selection opportunity arises. The aspect of the video that I liked the most was the montage of candid video reactions from the new ASCAN's themselves between 24-32 minutes in the sequence. Astronauts Chris Cassidy and Karen Nyberg offered their advice to the new ASCAN's their from orbital perch on the ISS during 38-43 minutes in the video sequence. If you missed catching the Hangout live, you can watch the archived video below. 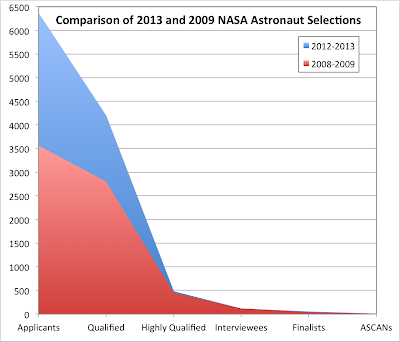 I find it refreshing that some of NASA's astronaut selection process is seeping into the social media arena. If the Google+ Hangout video is too long for you, check out the 7-minute Space Station Live video congratulating the new ASCAN's from ISS Mission Control. The new Astronaut Candidates will move to Houston and begin their training in August 2013. I wish them all the best in this exciting new chapter of their lives! A hearty congratulations to the 22nd Class—Ad astra! 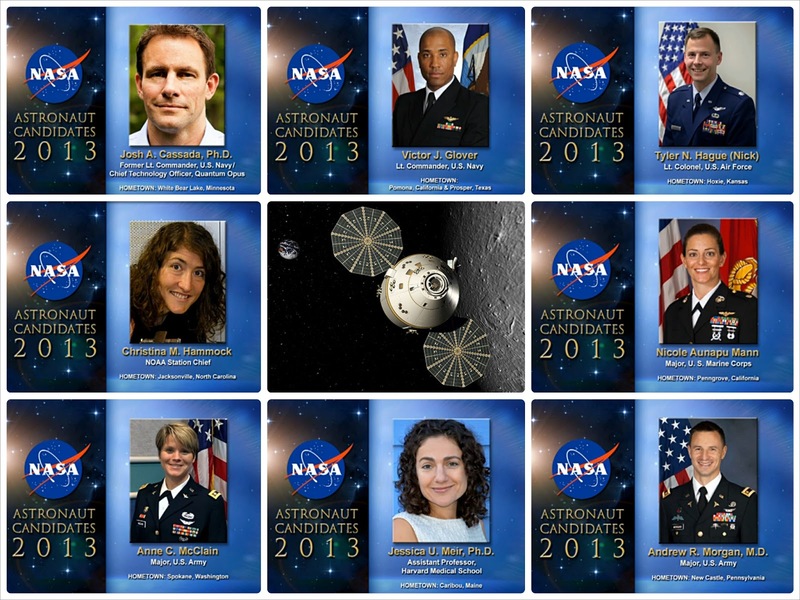 This is a really amazing story, congratulations to all of the NASA 2013 Class of Astronaut Candidates. These are incredible profiles, truly. I often follow Bill Nye from the planetary website to learn about new topics, including astronauts. I am fascinated by space exploration and the many advances of the last few years.